We have a fantastic beginner fly tying video as well as a couple of compilation videos of guides go to trout fly patterns. Nymph fly patterns...check. Big articulated streamer patterns...check. Midge fly patterns...check. Its all here, so get started tying. 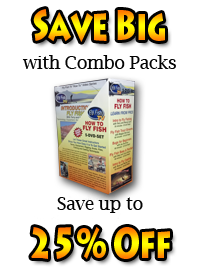 Every title includes complete fly recipe information as well as concise step by step fly tying instructions and close-ups of the process. Streamer flies are a tool that every fisherman needs to have in the arsenal, especially if you want flies for big trout! Nobody knows more about the streamer fly and tying streamer flies than Kelly Galloup. In his first video about tying streamer flies, Streamer Flies for Trophy Trout, Kelly covers a variety of single hook streamer fly patterns that have become household names like the Zoo Cougar. In Articulated Streamers and Streamers on Steroids, Kelly goes into detail on how to tie streamers that are big with great action. Big articulated streamer fly patterns are subject to rough wear, so the right material selection and construction are crucial for them to hold up and maintain that great articulated streamer action. Fly fishing guide Davy Wotton is a fanatic when it comes to creating & crafting wet fly patterns. His two DVD set, "Wet Fly Tying" is the gold standard when it comes to wet fly patterns. You will learn how to tie six flies along the way as well as the fly tying instruction for creating fly tails, bodies, wings, hackles and ribbing mediums. As far as lake and stillwater flies go we have you covered with four different fly tying videos from Denny Rickards. Denny is a master of fly fishing lakes and reservoirs and tying the trout fly patterns to fish them. His most famous creations are all included. In the videos you’ll find his stillwater nymph and callibaetis nymphs, seal bugger and emerging buggers, chub and shinner minnows, black and multi-tailed leeches, plus damsel and dragon fly nymphs.